On Sunday the weather turned warm and sunny and we decided to explore Kaliningrad. As I mentioned in my post Kaliningrad and the Jazz Festival, Kaliningrad is not a tourist city. As we wandered we noticed there were not many dogs, not much cell phone photo taking, no other languages spoken other than Russian, and no people of color. Our first destination was Kaliningrad’s central square. I had this kind of romantic notion we’d find a charming square with outdoor restaurants and shops. In reality what we found was a parking lot, and on this day (Sunday) it was filled with a farmer’s market selling fruits and vegetables, meat, fish, and other assorted merchandise. And we also found what locals call both “the Monster,” and the “buried robot” because of its appearance — it resembles the head of a giant robot which is buried in the ground up to its shoulders. Personally I find abandoned buildings fascinating, and I dug into Wikipedia to find out more about it. It was constructed on the ruins of the Königsberg Castle moat, the castle itself destroyed during the bombing of Königsberg in World War II. Königsberg became Kaliningrad and to the Soviet authorities the castle was a center of fascism and they razed what remained. Given this was a prime piece of real estate, the Soviet authorities started construction in 1970 on what was intended to be the central administration building of the Kaliningrad Oblast. But the area was marshy to start with, and building a heavy concrete structure on top of the moat ruins resulted in structural problems (let’s not let reality get in the way of politics). Finally in 1985 they gave up (and ran out of money) and construction stopped. And there it stood, looming over the central square (parking lot). While some may consider this building to be one of the worst examples of post-war Soviet architecture, the House of Soviets, as it was officially called, is actually a good example of Brutalist architecture. Brutalist is not a political comment here, but based on the choice of materials (the term does not derive from the word “brutal,” but originates from the French béton brut, or “raw concrete,” a term used by Le Corbusier to describe his choice of material). Brutalist buildings are massive in style (although not necessarily large) and fortress-like, and communicate strength, functionality, and frank expression of materiality— a perfect architectural choice for the Soviet bureaucrats. To add insult to injury, in 2005, for Kaliningrad’s 60th and Königsberg’s 750th anniversary (attended by President Vladimir Putin), the exterior was painted light blue and windows were installed, diminishing the sense of concrete and permanence. I’m sorry I never got to see it in all of its original glory. 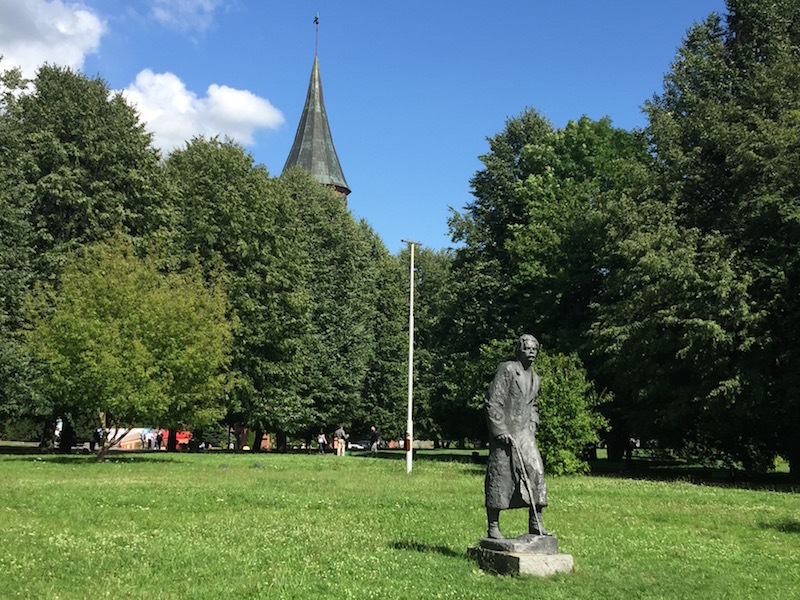 After that we strolled down to Kant Island to look at Kant statues as well as the restored Königsberg Cathedral, which houses a Kant museum. As far as the jazz festival was concerned, the lineup was international, and while much of the jazz was not the kind I really like, it was okay. But days 2 and 3 were also interesting because of the audience. While I could understand the high energy around Candy Dulfer & Band, a blend of smooth jazz and funk, what surprised me was the equal enthusiasm for the three 40’s/big band groups, and ZAZ, a French jazz singer. The last two nights were more typical of a concert you’d find in the United States. People taking selfies, sitting in unoccupied seats until the ticket holders shooed them away, standing in the aisles, and lots of standing in the seated sections. But I really felt sorry for the three women who spent most of the second night’s concert standing in front of us. The music was so loud it really made it hard for them to continuously talk among themselves during the concert.